We have hunted and truly enjoy South Africa’s East Cape. It is an absolutely wonderful place for your first safari or your 10th. Gifted with a huge diversity of habitat and species with some spectacular country and sea coasts, and many things to see and do, it is simply a wonderful place to safari. You can find all of the South African species here including the Big 5, but especially plains game in huge numbers and about 30 species of game overall. This particular outfitter takes special pains to make Safaris affordable and family oriented. Their pricing is basically all-inclusive from meeting and pick up at the Port Elizabeth Airport, driving you to their concession, to your guiding, hunting, meals, transportation and your return to the airport. Each and every thing is included, except for extra animals or services. 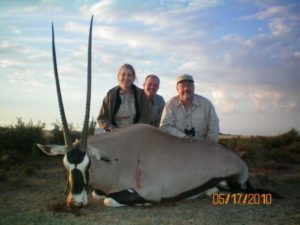 Most importantly, Hunt Nation has worked a special arrangement with this outfitter where if you bring a family member or a buddy as an observer (at only $180/day) they can help you shoot your package of animals or as your observer, they can shoot animals off the trophy fee list without paying the hunting rate. That is one heck of a deal. Almost a two for one! Also, this is a small, tightly organized operation that is very personal and is usually limited to a single group at a time so you get a lot of personalized attention. LODGING depends on which package you hunt. Typically though, you stay at their main lodge, which is a 200 year old converted farmstead, situated in the Central Karoo Region, that has been in their family’s care for 6 generations. It is very secluded at the foot of the mountains, nestled in the wild African bushveld in a mountainous amphitheatre in the Sneeuberg Mountain range, with no modern disturbances. They are also very eco-friendly, with a solar powered electric system in 220 volts, so that they can accommodate all modern conveniences. Their Wi-Fi system will keep you in touch with all your loved ones and business interests. They are a mere 40 minutes drive from the very Historic Town of Graaff – Reinet. Take a leisurely stroll or guided walk amongst the many tall Acacia Karoo trees that are customary in the riverine bush, with abundant red buffalo grass, creating a blanket along the rivers banks. Be truly “in the bush” relaxing in beautiful and tranquil surroundings. Here only the chorus of birds at day break and the lonesome bark of a kudu bull being disturbed, break the silence of the African bush. They offer “ALL INCLUSIVE” accommodation, all food, beer and local wine and non-alcoholic drinks. They use clear spring water of a mineral quality, that is pumped from an underground aquifer. Bottled water is also supplied. The lodge is serviced daily with your laundry ironed and folded on your bed each evening when you return. It sleeps 2 people per room, in double or single beds, all with en-suite bathrooms and modern day conveniences. The lodge sleeps up to 8 guests. The guests are treated to Traditional South African Cuisine, with a large garden and pool area to relax in. This is an ideal getaway for a group of family or friends, or simply that quiet holiday on your own. Sit and stare at the stars, listening to the hoot of the African Owl, while sitting at the large open fire pit. This is also a great place for coming together at night to socialize with friends and discuss the day’s adventures. After a delicious South African supper with red wine, you can retire to your room which is furnished with a comfortable king size bed or 2 single beds, feather duvets and pillows to ensure a good nights rest after a long day in the bush. Linen and towels are provided. The en – suite bathrooms each have a double basin set, shower and flush toilet, and hot and cold running water. The outfitter works with other concessions too, so once you know your package we at Hunt Nation can arrange for the appropriate lodging. Price wise, look carefully at the differences in the animals included in the packages. TRAVEL: Typically clients fly via South African Air or Delta into Johannesburg; then take a connecting flight into Port Elizabeth. Some clients take Lufthansa into Germany, with a 6 to 8 hour layover, then onwards to Johannesburg. Our personal preference has been to fly into Johannesburg, overnight, then fly onward the next morning. But importantly however you go, there is FREE airport pickup and return—MORE SAVINGS!! HUNTING: The hunting is done in typical safari-style, being a combination of spot and stalk using vehicles and walking to get into range. 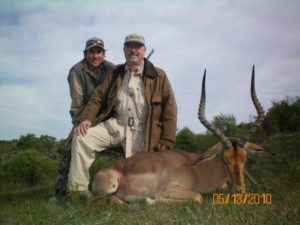 The outfitter has reliable safari-style vehicles and anyone in reasonable physical condition can do these hunts. The outfitter will tailor the hunt to fit your physical condition and your wishes. As always, being in good physical condition always is an advantage. After a light breakfast, take to the field, and normally you will be seeing game almost immediately. Lunch can be in the field or at the lodge, depending on where you are and what the daily plan is. Dinners are leisurely, often around the fire pit and with a drink in hand. Relax and enjoy! They have a huge variety of game here, and can even arrange for the Big 5 if you wish. Their trophy fee list and their packages are set forth at the end of this information And realize we can customize the packages by changing or adding animals. Just ask us! They also have a concession in Mozambique, one of our favorite destinations. Just inquire if interested. MEDICAL: This is a malaria free area; so normally just make sure your regular shots for things like tetanus and hepatitis are up to date. WEATHER: If you simply think about their seasons being reversed from ours, that will help you. So our April is their October, being the beginning of the fall safari season. Our June is their December, and you can expect temperatures in the 30’s and 40’s in the morning, warming to 60 to 80 during the day. Rain is possible, but sunshine is the rule. We suggest layering, perhaps as an outer jacket a lightweight camo Goretex rain parka (un-insulated); with a wool sweater and then a shirt. That way you can adapt as the day warms. Ask us for our detailed equipment list. Also please ask any questions you wish. Hunt Nation always wants your trip to go smoothly. Better to ask than guess! And please ask for our Equipment list, if you want it. It avoids forgetting that one thing! WEAPONS: Your normal deer rifle or elk rifle will suffice with premium quality bullets. Anything from a .270 on up is fine, or you can rent a rifle if you prefer. If you bring a rifle, there is a permit process, which is not terribly complicated. Hunt nation can assist you thru it. SAFETY: Simply put, stay away from the rough city areas at night. If you do that, you should have no problems. Cities are just not good places for you to be out in, at late night. The Rural countryside where you stay and hunt though, is settled, very safe and American friendly. (All packages include airport pickup, guiding, lodging, meals and specified game). WE CAN PUT TOGETHER ANY PACKAGE OF ANIMALS THAT YOU MIGHT WANT. JUST ASK US! 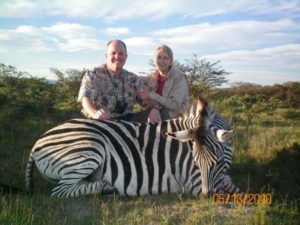 All their hunts are operated out of either their Main lodge, or out of one of the nNumerous Luxury lodges situated around Southern Africa but mainly in the Eastern Cape. Most plains game Safari’s utilize their many Concessional Hunting areas around the lodge with short trips to neighboring game farms not exceeding 40min to an hour. A much larger part of the country is seen and experienced in this way. The accommodation is as comfortable as any of our local 3 star hotels. 7 Day: choose 5 animals from reduced pricelist 10 day: choose 8 animals from the reduced pricelist. 7 days buffalo hunting in the Mpumalanga Province, near Kruger National Park. MANAGEMENT HUNTS- CULLING ANIMALS- LOTS OF SHOOTING! In terms of tweaking your skills at shooting game, you typically will get more shots in one day then in 8 years of whitetail or mule deer hunting! Culling is Just plain necessary to keep herds in check, but you get all the fun! These are all management animals, as periodic meat culls are a necessity to manage the vast herds of game. Great for hunting experience with many valuable lessons learned without losing “. . . that big one. . . or breaking the bank.” Maybe you have the African game you want- then consider a cull hunt ! ADD a 10 Springbuck Driven cull hunt for only $800.00 to your package. Add $1260 for The 10 Cull animals of the 7 Day cull package. ADD $1 800. for the 14 animals of 10 Day. Fishing trips are offered at $150/person boat min $ 700 and 8 people max per boat. square up at the end of your safari. You pay a Daily rate and then add the trophy fees. • Accommodation, all meals, soft drinks beer and wine. • The preparation, dipping, packing, documentation and export of trophies from South Africa. They will also arrange for game viewing tours; fishing trips, shopping, elephant rides and parks, amusements spas for the ladies, and much more. Just inquire and we will help you make a plan! The fishing is dependant on good weather so it’s difficult to book any particular day but usually if I know people are interested I let the charter guys know and they normally give me a day. The fishing is usually from about 7 in the morning till 12 midday and we will have a BBQ with the fish caught. I have had a group of guys spend 3-4 days at the coast fishing every day. In summer Nov, Dec , Jan, Feb if the water gets to 20 degrees ’C you have a good chance of game fish. We normally fish with hunting clients in May-July. In May we get a Yellow fin tuna run, we also get Cape salmon ( pictured on my Face book page) We use a 21ft cat and do a river launch and beach exit and mainly fish for Reef fish about a mile or 3 out. We can also fish for ragged tooth shark. I’m not sure on international names as I only know the local names of fish ie Cob , red Romans, Daggerheads , cape salmon, sand fish, Miss Lucys, black muscle crackers, occasionally Yellow fin and steenbras.